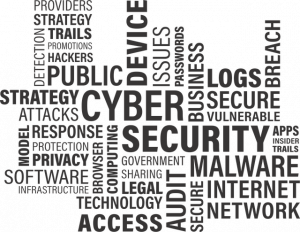 Talking everything Information Security, from Penetration Testing, System Hardening to Information Assurance. 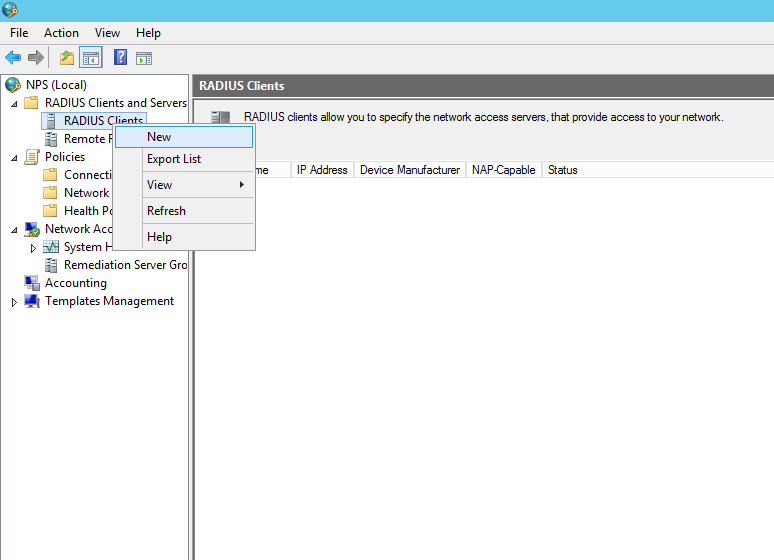 Cisco, AAA, Radius, Active Directory, Windows Server 2012 R2, NAP role, NPS its all going on! Just a quick note to reference the following video on YouTube. This video demonstrates setting up Active Directory Authentication for Cisco Devices, such as Routers and Switches etc. 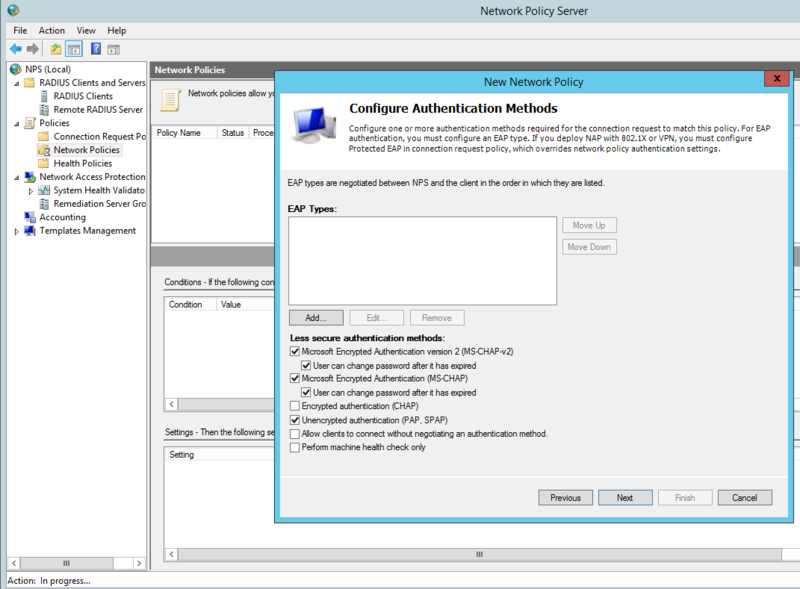 This is using AAA on the router and RADIUS through the Network Access Policy (NAP) role in Windows Server 2012 R2, this in turn enables a Network Policy Server (NPS). 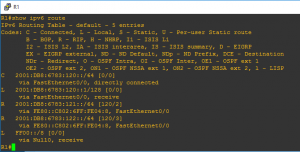 The Windows server (the Radius Server) is registered in Active Directory which allows it to query the domain it is connected too for authenticating users in Active Directory to the Cisco IOS devices. 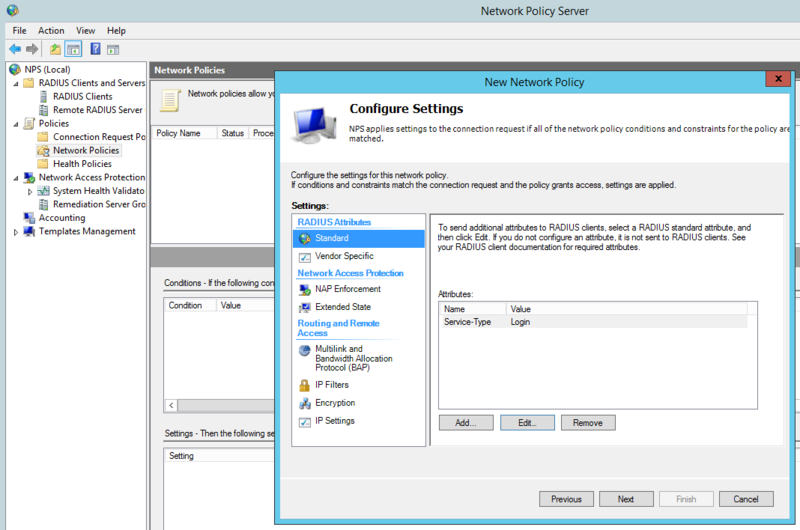 You can control who has access to various network devices through rules created on the NPS. This can in turn be achieved in Active Directory via groups, binding those groups to privilege levels to pass through to deifferent devices. For example you could have a group in AD called Network Admins which is tied to a prilivelge level 15 group rule in the NPS configuration. This rule would pass through the privilege level 15 setting through to the IOS configuration. Members of this AD group upon succesful authentication would then be granted privilege level 15 access on the router or switch. Ways to mitigate VLAN Hopping Attacks on a Cisco Switch. The ways in which we can prevent basic vlan hopping attacks on a Cisco Switch are more best practice security configurations. Vlan hopping attacks can occur in one of two ways. The first by an attacker spoofing DTP messages directly to a switch, if the switchport has Dynamic Trunking Protocol (DTP) enabled it can then negotiate a vlan and receive tagged packets for that vlan. The second is by introducing a rogue switch and again taking advantage of DTP and negotiating a trunk with the switch and then allowing it to receive all vlans. Not good! 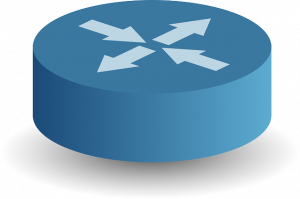 Disable Dynamic Trunking Protocol (DTP) for non-trunked ports with switchport mode access – this should always be done for all ports straight out of the box! Disable Dynamic Trunking Protocol (DTP) for all trunked ports with switchport non-negotiate. Manually enable trunk ports with switchport mode trunk. Put all unused ports into an unused vlan and then disable all unused ports – again disabling all unused ports should be done straight out the box. 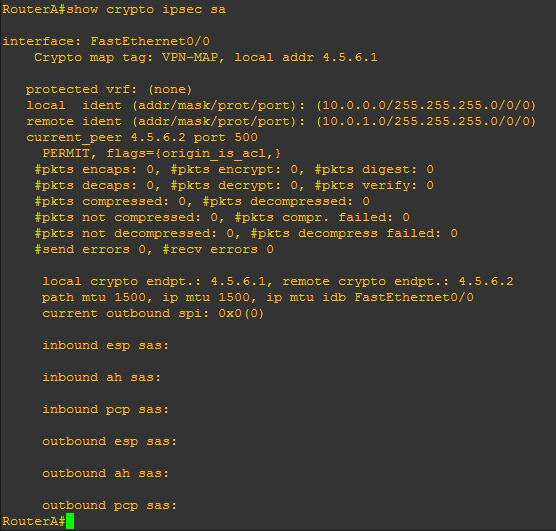 I thought I would run through configuring IPSec Site-to-Site VPN Tunnels on a cisco router. 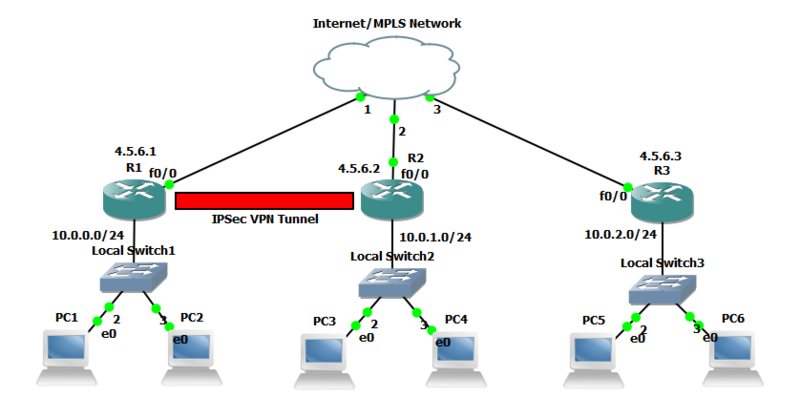 I’m going to be covering at high level the basic principles needed to configure a IPSec Site-to-Site VPN. The fundemental principals can be used for the Cisco ASA Firewall or Cisco VPN concentrator. The VPN gateways in our example (the routers) are responsible for encapsulating and encrypting the outbound traffic which in a real world example this would from be from a site to a peer gateway at another site. This could be either through an MPLS network from an ISP or more commonly directly over the Internet. When the receiving gateway receives the traffic it strips away the headers, decrypt’s the content with the pre-shared key and forwards on the traffic to a host network on the inside. In our example we are going to be using 3 networks with an IPSec VPN tunnel being established between two of the routers. I have added the extra network without the tunnel to demonstrate in wireshark the encrypted vs the non encrypted traffic. All three networks are connected to a switch which we are going to image as our either our Internet or MPLS connection. An ISAKMP tunnel is initiated when the VPN gateway detects ‘interesting traffic’ which is defined by an ACL. IKE Phase 1 is established through negotiating the ISAKMP SA policy that is defined in the config. IKE Phase 2 is established through negotiating the IPSec SA policy. The IPSec tunnel is created and data can begin to be transferred Encrypted. The IPSec tunnel is teared down when either the lifetime of the session expires or the IPSec SA is removed. 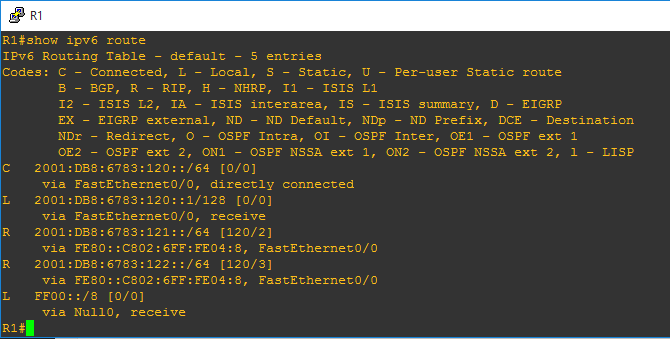 Below is the extra config that is used for each router other than the initial config of a standard GNS3 router, this can simple be copied into global configuration mode. The config is split into three main sections the interface configuration, EIGRP configuration and the IPSEC configuration. 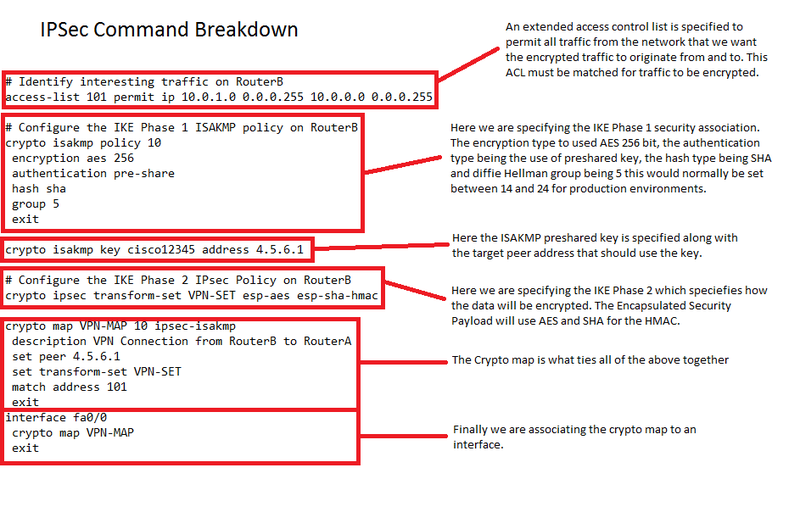 Before generating any interesting traffic if we execute ‘show crypto ipsec sa’ from RouterA we can clearly see there has been no traffic captured by the ACL. 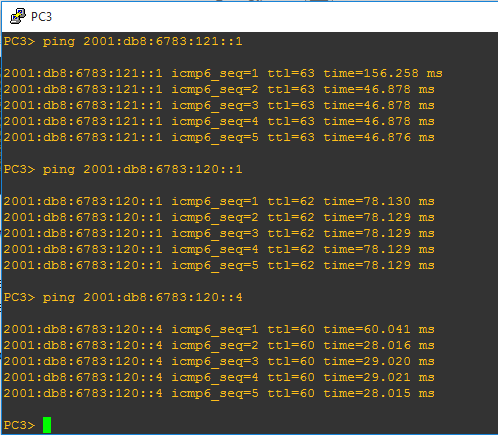 If we now generate some ‘interesting traffic’ such as a ping from PC1 10.0.0.2 to PC3 10.0.1.2 which will match our ACL that is specified in our crypto map, then re-issue ‘show crypto ipsec sa’ we will see from the stats that packets have been encrypted. Further to this we will see the inbound and outbound session will be ‘ACTIVE’. As we can see from the wireshark capture our encrypted traffic is shown in the Encapsulated Security Payload and our non encrypted traffic in the clear (the ping request and reply). 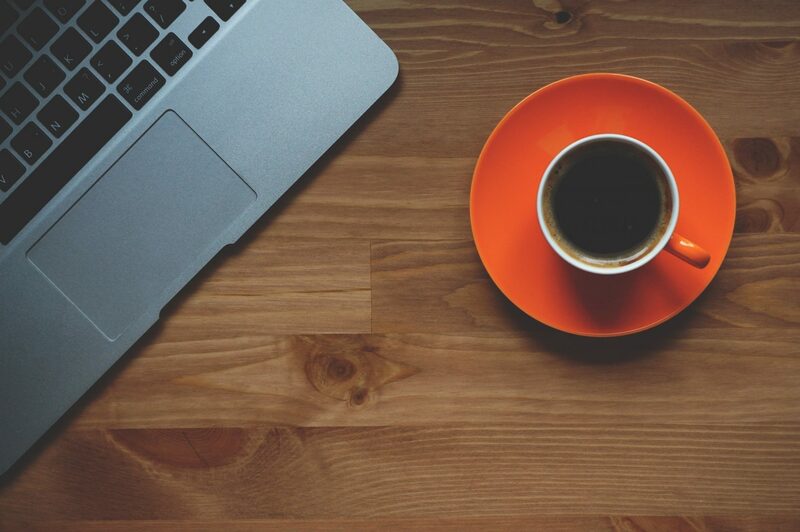 I thought I would cover a quick post to demonstrate setting up Active Directory authentication for a Cisco router or switch IOS login. 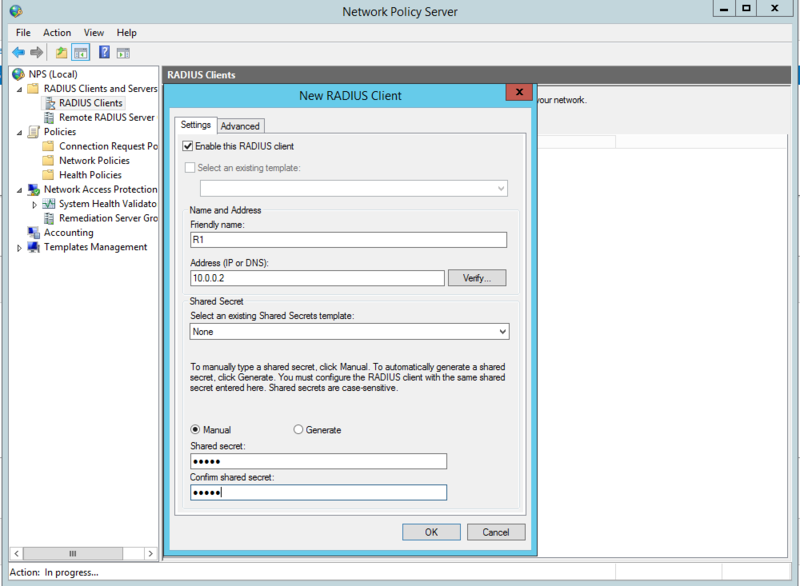 This will be using AAA and RADIUS through the Network Policy Server (NPS) role in Windows Server 2012 R2 to authenticate users in Active Directory on Cisco IOS devices. 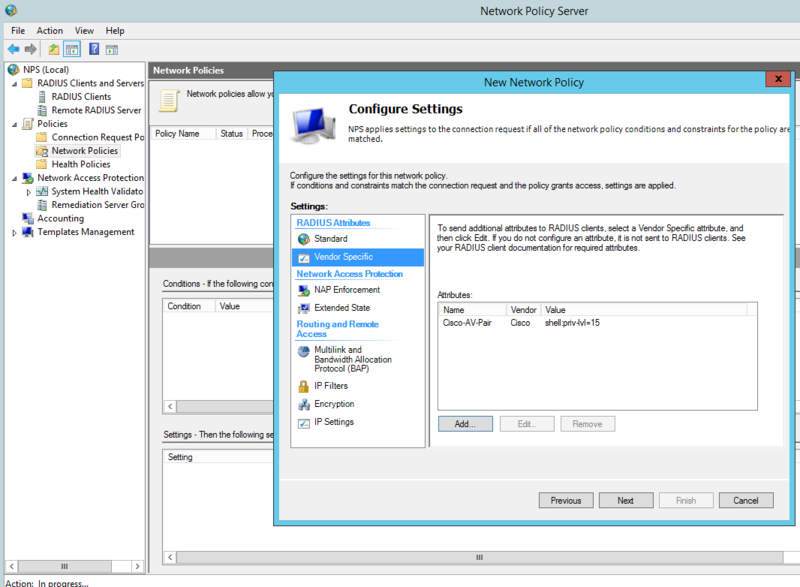 Server 2012 DC: Windows Server 2012 R2 ( Active Directory Domain Services and Network Policy Server role. I will be assuming that AD and the NPS role have already been installed. Prior to jumping into the NPS configuration you will need to create an AD group for the users that will be logging into the Cisco equipment, add a couple of test users to this group. In my case I have simply created a group called ‘Radius’ and have added the user ‘Adam’. 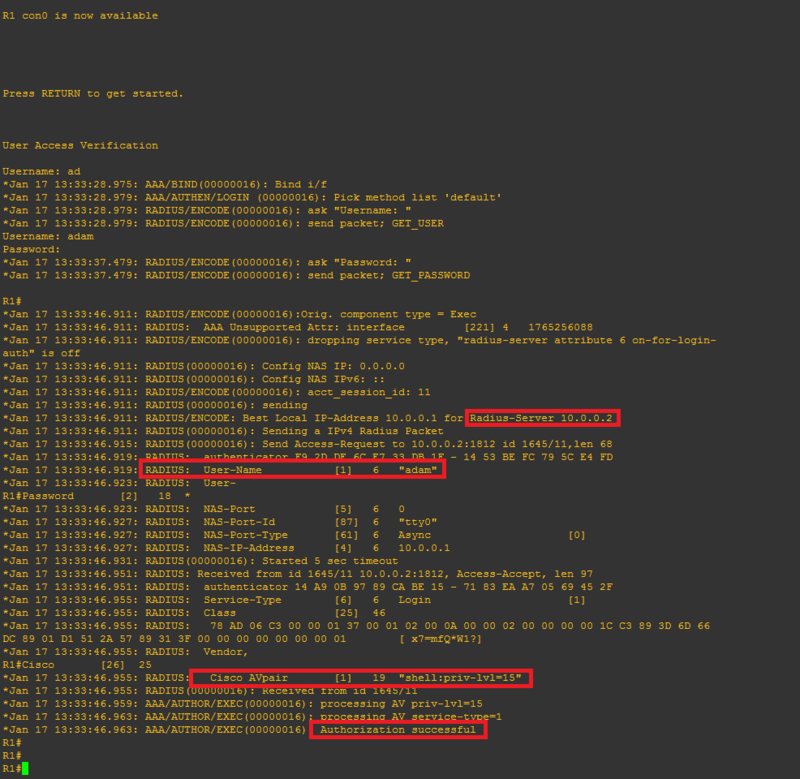 Add a Vendor specific attribute, this allows the radius server to pass the privilege level though the cisco router which we shall see later in the debugging. The value needs to read ‘shell:priv-lvl=15′. You can create several policies for the different privilege levels. 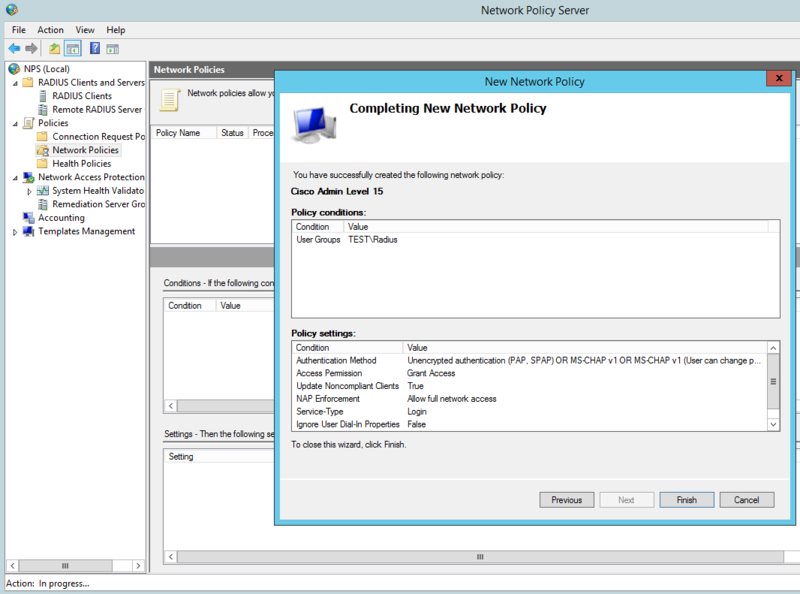 For example you could create a group in AD called ‘Cisco Users Priv 1’, associate this group to a policy and in the below option use the value ‘shell:priv-lvl=1′. 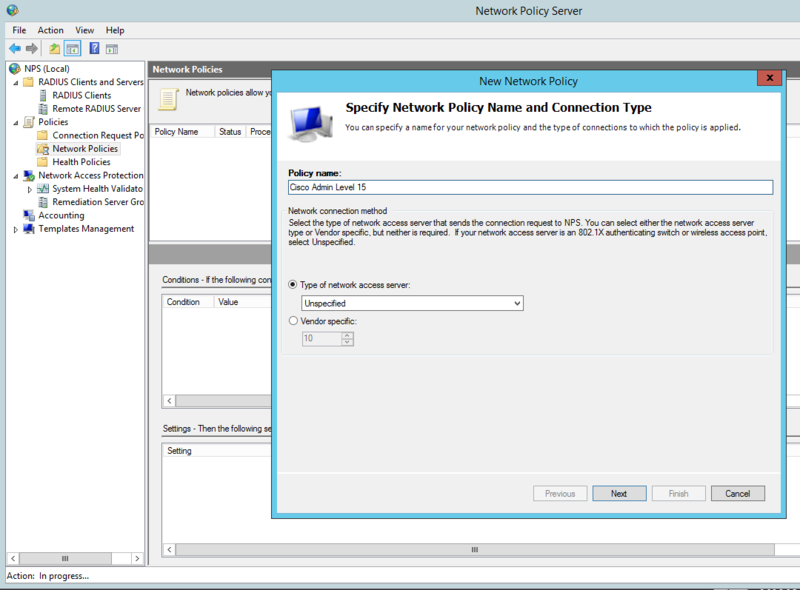 When that user logs in the policy will match that user and the NPS use the matched policy passing privilege level 1 through to the router or switch. Create a a user with privilege level 15, we wil use this as our fall back should the router not be able to contact the radius server it will use the local AAA database. We can test simply by logging out and back in. It obviously goes without saying you need to test the authentication to the Radius server, exit right out of the console and log back in using your AD credentials. If all has been configured correctly you should be able to login. its also worth testing the fall back option configured for local AAA authentication. We can do this just simply stopping the NPS service then try the local credentials, again all being configured correctly you should be able to login. I hope this has been informative. 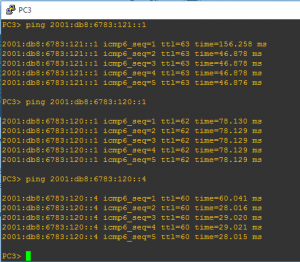 I decided to to look into configuring a quick simple IPV6 lab in GNS3 using RIP. 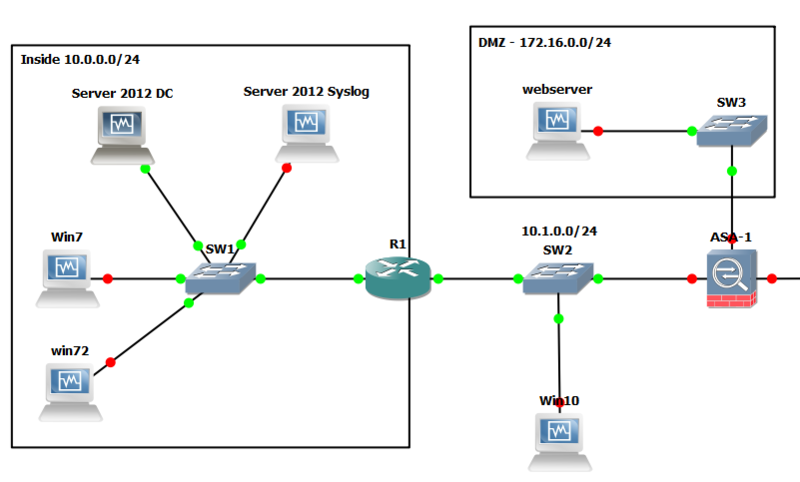 I put together the following lab using the RIP routing protocol for ease of use. The lab consists of 3 routers multiple interfaces, 3 subnets, 3 PC’s and switches for endpoint connectivity, I find its easier to use the virtual switches if I want to expand the lab later. The routers are the using the c7200-adventerprisek9-mz.152-4.S4 image and the PC’s are simply the virtual PCs (VPCS) from GNS3 again for ease of use. I do normally prefer to connect an actual operating system as PC’s as I find it more realistic however as we are just testing connectivity and routing the VPCS option is a good fit here and light on system resources. Some of the basic configuration for RIP and IPV6 is show below for R1. This can then be replicated across the other routers and interfaces changing the IPV6 subnet ID and Interface ID as you go along. Using Global IPV6 addresses with a made up subnet ID. 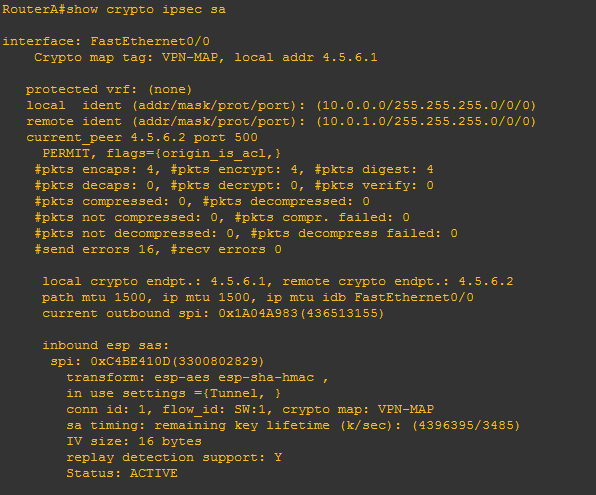 verify the ipv6 interface configuration. We can see the advertised routes for rip, also notice that the advertised route is via its IPV6 Link Local address starting with FE80. 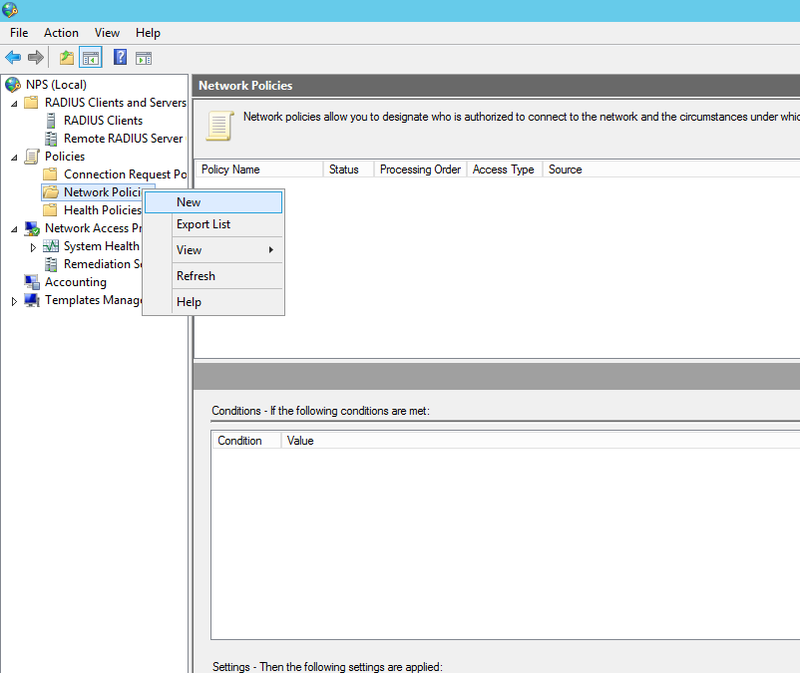 Checking endpoint connectivity from PC3 to PC1. Interesting, more to come from IPV6 in the future for sure. I thought I would share with you the Lab I have been mostly working with for CCNA Security (CCNAS) – Implementing Cisco Network Security (210-260) exam that I have recently took and passed. I have also used several smaller lab setups for specific testing however this is the main lab to piece everything together. The lab has been built to accommodate the many elements on the exam and covers off most of the practical procedures that you need to be comfortable with. Using GNS3 and VirtualBox we are able to lab most of the practical exercises bar the L2 switching portions which I achieved through physical equipment (Catalyst 3750, 3550 x2 and 2950 switches). The exam does cover many topics in theory that you must know, these aren’t covered here, however can be found on the Cisco website. The lab contains several client machines for managing the routers and ASA firewalls from putty, cisco configuration professional and ASDM as well as testing PAT through the ASA with a breakout to the internet. 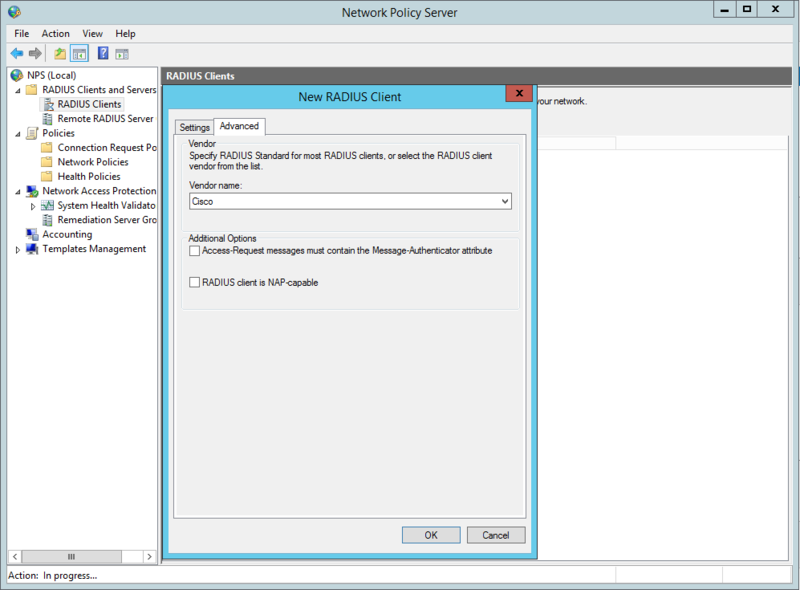 There is an Active Directory Domain Controller with the Network Access Protection role installed for use with AAA/radius and NTP. A separate syslog server. A DMZ with web server for testing NAT and outside firewall rules. There is also an ASA 5520 at each of the three sites for testing VPN site-to-site Ipsec connections, clients at all sites for testing end to end connectivity. There is also an outside remote client for testing the Anyconnect and client-less vpn options which takes advantage of the AAA radius service. Well what next, CCNP Security of course.